A few weeks ago Mercedes-Benz invited my wife — who works as a contributing editor for an UK based lifestyle magazine for over ten years now — to Palo Alto. For those who aren't familiar with all the interwebs tech talk: Palo Alto is kind of the epicenter of all the Silicon Valley high-technology companies, including Hewlett-Packard, Tesla Motors, Facebook and Google. 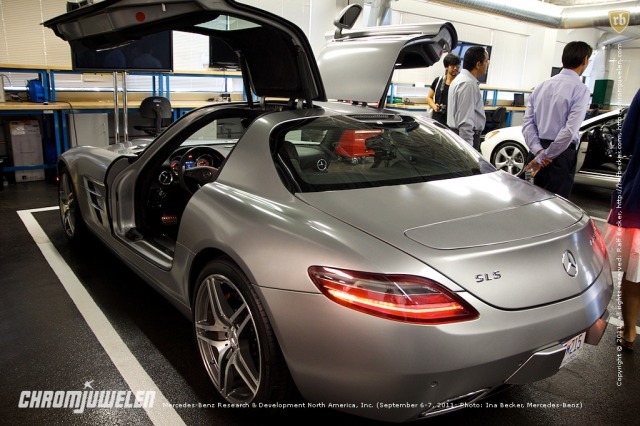 When Mercedes-Benz founded the Mercedes-Benz Research & Development North America, Inc. in 1994, the headquarter in Palo Alto was the first Research & Development Center of an automotive company in Silicon Valley. Mercedes-Benz invited selected media people to provide insight into their latest tweaks of their multimedia System "COMAND Online". Only a few months after the launch of the new multimedia generation, Mercedes-Benz is extending the range of integrated apps: new apps for Facebook, for Google Streetview and Google Panoramio will be available for COMAND Online from this autumn. Additional apps which have already been introduced are Google Local Search and Weather and the facility for downloading a route which has previously been configured on a PC using Google Maps and transmitted to the car. Over a dozen additional apps are planned in the medium term. These are currently under development, in some instances in collaboration with innovative start-ups such as the US talk radio operator Stitcher, the Twitter short message service and the popular music providers Pandora in the USA or Aupeo in Germany, for example. The new apps will be usable by all customers who drive a Mercedes-Benz with COMAND Online and will be provided by Mercedes-Benz via the so called Daimler Backend Server — so customers can update their COMAND Online without going to a Mercedes-Benz dealer. An overview specifying the telephones on which the COMAND Online apps can be used is available at the website www.mercedes-benz.com/connect. For sure, I am not the target group — as I use all those apps already on my mobile phone. But for everyone else, who is not such a nerd as I am, this is just a perfect way to get hands on the mobile internet. Err ... wait a second ... can I jailbreak it?